Book 10 of 100 in the Great American Read list. Bless Me, Ultima is Magical Realism in its purest sense. Magic, animal spirits, dreams, folk legends, gritty circumstances and wonder. But Magical Realism is a distinctly Native American and Latin American genre, I was nervous about reading this book, I thought it would be alien to me, so far outside of my own experience that I wouldn't understand it. So, I worked hard to understand context and imagery, and it was worth it. Stopping to look up translations of phrases in Spanish was an education in itself. I also read a children's book of folk tales from New Mexico, which helped me learn more about the imagery, but also about the route of Fairy Tales from the old world witches to the new world brujas. I was talking to a colleague about Bless Me, Ultima and had cause to say the word Chicano out loud for the first time. Before I read this book, I didn't realize that Chicano was any more than a racial slur. Because that's the only way I'd heard it used. My colleague (who considered herself Chicana when she was growing up on a farm outside Sacramento) explained to me about how that identity became synonymous with the Chavez labor movement. All this was American history I didn't know before. But I do now. Antonio is the young son of a poor Chicano family in New Mexico during the second World War. His mother brings a local wise woman and healer (or curandera) into their household and trouble follows her. That trouble is particularly hard on Antonio who forms a strong, but wary connection with Ultima because his intelligence and empathy leave him open to her magic. 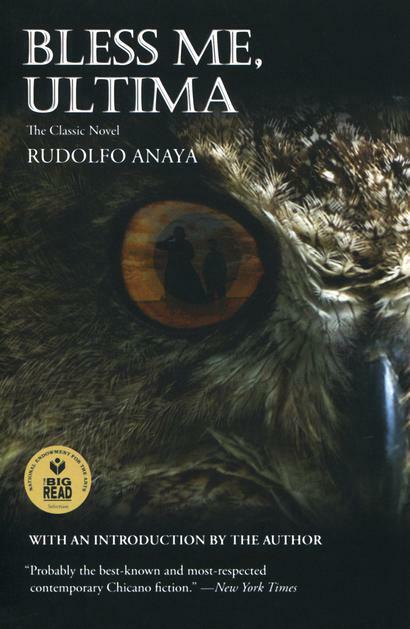 The book shows us Antonio's coming of age as a part of the constant struggle between ancient and modern religions as well as the struggle between the two parts of his personality, the wild and free vaqueros like his father and the gentle domesticated Lunas like his mother. There are some surprising parallels between The Adventures of Tom Sawyer and Bless Me, Ultima. Superstition and tales of ghosts and witches are key elements in both stories. There's a real sense of physicality of children, as both Antonio and Tom experience things by doing them. Both Injun Joe and Jason's Injun are ominous portents. Both the protagonists witness a murder while they are young. And the presence of the river is an important backdrop, in some instances, even a character. But the differences between these two books are massive and perhaps more telling. For Antonio, the superstitions are true. Ultima really is pulling a curse out of his uncle Luca, the owl really is her familiar. The murder affects Antonio enormously and he's much more empathetic than Tom. Why is it on the list? Most likely because it's the earliest example of a successful novel about the Chicano experience. This makes Bless Me, Ultima much in demand for multicultural studies and world literature classes. But it's important to remember that the book originally sold by word of mouth within Chicano communities. "It was published by Tonatiuh International Inc., in Berkeley, California. It has sold 80,000 copies without a review in the major media." If ever there was an argument for "own voices" publishing. Bless Me, Ultima is it. There's a section in the middle of the book where Antonio and a few other boys are snowed into the school and with the help of a sympathetic teacher create a chaotic nativity play. It's a strangely comic interlude, which most likely serves to remind the reader that Antonio is still a child. The "chaotic nativity play" could well be described as a genre of English comedy. From Joyce Grenfell to Nativity! there's plenty of comic mileage in the English tradition of every public elementary school's annual production of the story of the birth of Jesus. Bless Me, Ultima could easily have been too alien for me to comprehend, instead it both taught me something new about America and reminded me that within the vast experience of America there is some commonality with my own experiences. And that makes it a very good book indeed.